You can't get closer to the Grand Haven Boardwalk. It's as simple as walking out the main doors on Washington and across the street! The sailboat sculptures and rolling green hill is a popular place for picnics. 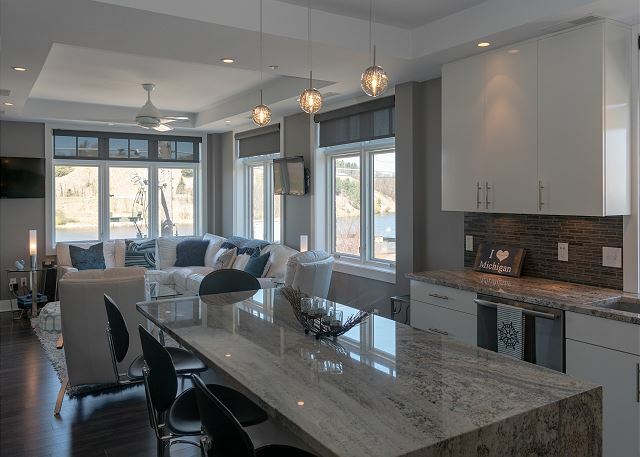 Just high enough to offer great views, unit 305 of the Zephyr is conveniently located in the downtown area, within walking distance to great restaurant options! You'll have the best seat in the house for the nightly showing of the Musical Fountain atop Dewey Hill. The beautifully decorated living room is as comfortable as it is pretty. You'll feel spoiled with two flat screen televisions, a DVD player and blinds that go up and down with a touch of a button. The couch is also a queen sofa sleeper! You'll love this bright and open kitchen with all stainless steel appliances. It comes fully stocked with dinnerware and cookware. The dining table seats six and is conveniently located just across from the kitchen. There is also a beautiful bar in the corner for easy entertaining. The Master Bedroom features a Queen bed and an en suite Master Bathroom, there is also a flat screen television. 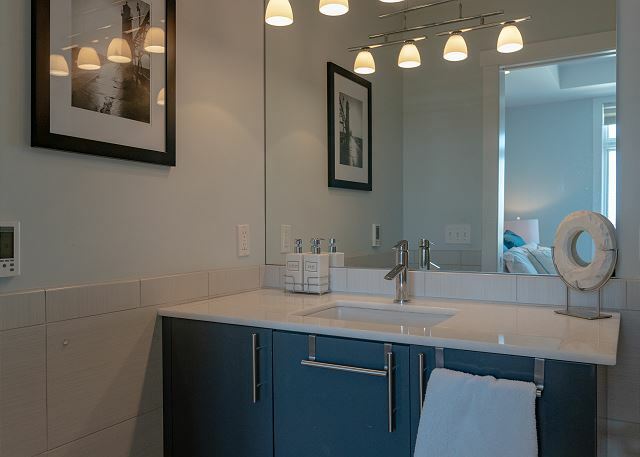 The Master Bathroom is conveniently located right inside the Master Bedroom and features a big walk-in glass shower. This beautiful Master Bathroom shower has plenty of built-in shelves, a rainfall shower head coming out of the ceiling, and a secondary luxury shower head in the wall. Bedroom #2 has a comfortable Queen sized bed and a flat screen television. You'll love lounging in this comfortable room watching your favorite show on the flat screen tv. 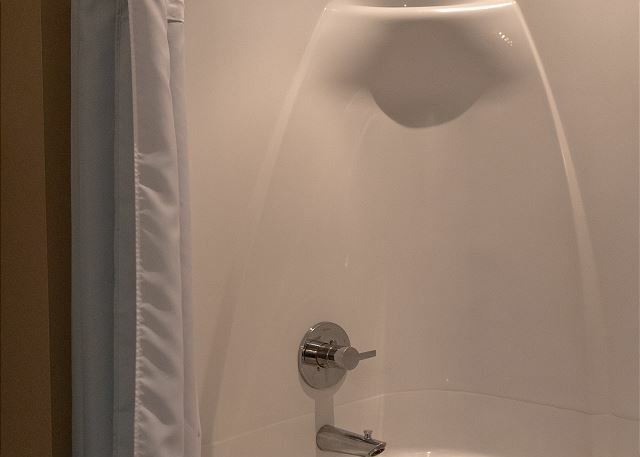 Enjoy the convenience of a tub/shower combo in this full bathroom. The stackable washer and dryer are located in their own separate closet, along with an ironing board and iron. 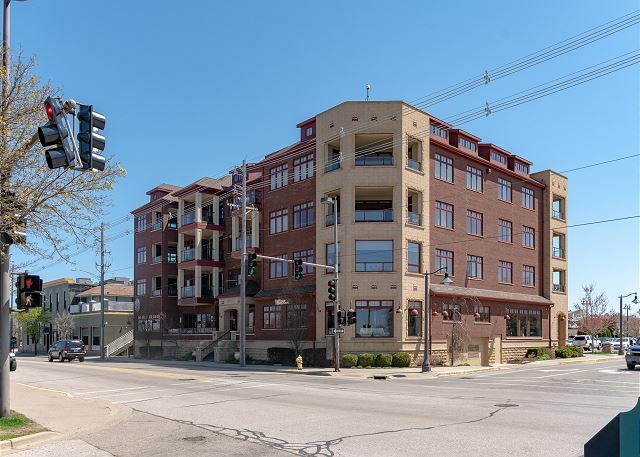 You will love the convenience of being centrally located in the downtown district and close to everything! You'll love watching the boats going out and coming in through the Grand Haven Channel. Have a morning coffee on the balcony and enjoy the serenity of a quiet summer morning in downtown Grand Haven. You won't soon forget the views of Grand Haven from this vantage point! Sitting on the third floor of the affluent Zephyr building, this 2 BR, 2 BA articulately decorated condo affords all the luxuries you would expect to find in a vacation home. Close to restaurants, shopping, beaches, and in the heart of the downtown, you will understand why Grand Haven is the place to be for summertime fun! You will feel right at home as you enter this beautifully-decorated condo. 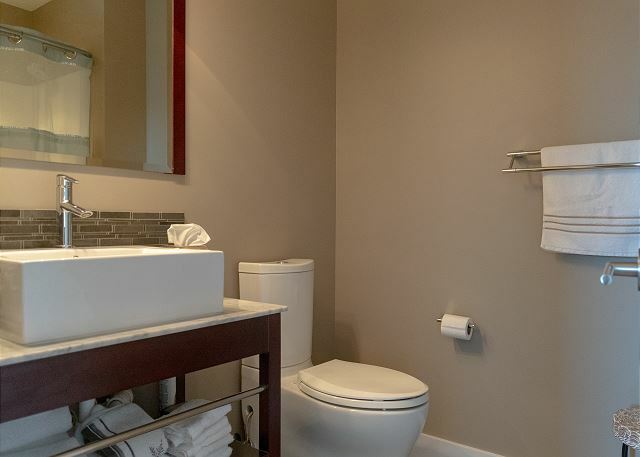 The master bedroom with flat screen tv, comfortable queen bed and en suite bathroom with luxurious rainfall, walk-in shower will have you feeling like royalty. The second bedroom also has a queen bed and flat screen tv, with an adjacent full bathroom across the hall. The kitchen is well stocked with high end appliances, and is open to the living room and dining room. The dining table will accommodate six and is in close proximity to a beautiful bar. In addition, there is seating for four at the counter-top breakfast bar. The living room is inviting and comfortable with white leather furniture and multiple flat screen televisions. Your own private balcony, accessible from both the living room and dining room, is the perfect place for both a cup of coffee in the morning to welcome the day and a glass of wine at night to enjoy the best seat for the famous Musical Fountain. During the day watch boats going in and out of the big lake, and if you're lucky, catch a glimpse of a big freighter maneuvering its way through the channel. Parking: Parking is provided for one vehicle in the underground parking garage. Additionally, there is a city parking lot behind the building. The kiosk to purchase an overnight parking pass is located on the corner of 1st and Franklin. This condo sleeps 6. All bed and bath linens are provided. You will be right in the heart of downtown. Walk the boardwalk out to the famous lighthouse and pier, spend the day at the beach, take a stroll along the water's edge, watch a sunset, catch a nightly Musical Fountain show, get ice cream, play miniature golf, take a charter fishing boat out to the big lake and catch your fresh dinner, take a trolley ride and learn about the city's unique history, go shopping, and enjoy dinner at any of the amazing restaurants you'll find within walking distance. Grand Haven is a true summertime beach community with an endless variety of activities and things to do. Enjoy your Unsalted Vacation - free of stress, free salt! Had a great time in Grand Haven with the family. 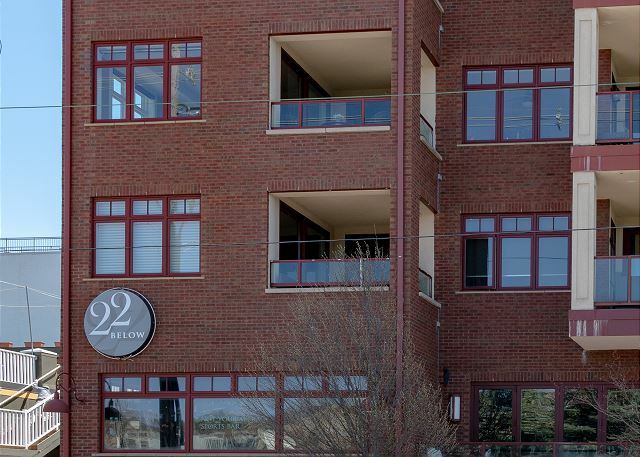 The condo was in a great location near all the downtown stores and restaurants. It was also right across from the nightly musical lighted fountain show which was great for the kids. The condo was very clean and comfortable. It was a great vacation. The location was perfect and the condo was fantastic! The garage parking underneath the building was much appreciated as parking in the public areas was packed. I would love to stay in this condo again in the future. Hi Thomas - we are thrilled to hear that you enjoyed your stay. The location and the views from Channel Glam cannot be beat! Thank you for choosing Unsalted Vacations, please come see us again soon.